Pancake Day, also known as Shrove Tuesday, is a traditional Christian celebration before the period of Lent. This year, Pancake Day will be celebrated on Tuesday March 5 2019. Historically, before Lent fasting took place, many people didn’t want to waste their remaining ingredients, so instead they made pancakes. Traditionally, it is custom to eat sweet pancakes on Pancake Day but as more people are turning towards a vegan diet, you might want to consider replacing the sweet tradition with a tasty savoury, vegan alternative instead. Health aware high street retailer, Robert Dyas is equipped with all the essentials to create delicious vegan crêpes this Pancake Day as part a plant-based diet. Start with cutting deseeding an avocado and cut into small cubes and set aside. Do the same with the courgette and fry in a bit of oil, lemon juice, soy sauce and garlic. Once they soften turn down the heat and add some fresh cut dill to it. Set aside as well. 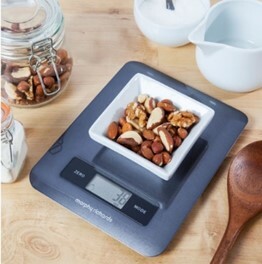 Measure your self-raising flour, gram flour (chickpea flour), soy milk, salt and garlic using the Morphy Richards Electronic Kitchen Scale – Black (£21.99) for a precise amount of ingredients – you don’t want to accidentally add in too much flour. Or worse, too much salt! To start blending the ingredients, why not use the Colourworks Silicone Whisk – Red (£2.99 was £5.99)? Alternatively, if your manual whisking days are behind you then the electric Beko Sense Hand Mixer - White (£18.66 was £27.99) may be ideal for you. Whisk up a storm in this Colourworks Large Melamine Two Tone Mixing Bowl - Red (£6.49 was £15.99). The 4L capacity made from durable melamine means you can use the long-lasting bowl to make enough batter for the whole family. To scoop up the pancake batter, use the Kitchen Craft Master Class Soup Ladle with Soft Grip Long Handle (£4.99). This ladle is made out of stainless steel making very durable as well as being dishwasher safe will make it very easy easy to clean up after scooping up all the pancake batter. 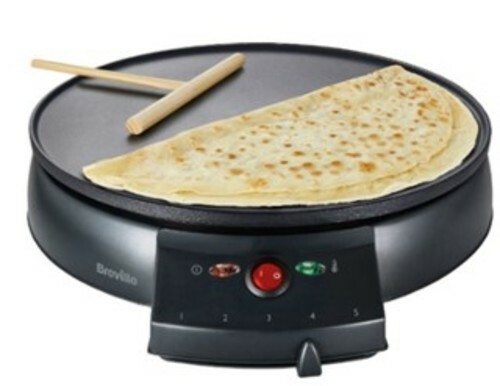 Pour your batter carefully onto the Breville Traditional Crȇpe Maker (£22.49 was £29.99). Use the ‘T-stick’ to evenly spread out your batter to create a flawless, circular pancake shape. If you prefer to cook the pancakes in a frying pan, add some oil to the Hairy Bikers Aluminium 2 Piece Frying Pan Set (£12.99 was £29.99). The pair have a non-stick feature means you don’t need to worry about your pancake sticking onto the pan’s surface. If you’re not a pro at flipping with the pan and you’re worried that your pancake will hit the roof, use the Colourworks Silicone Spatula - Blue (£5.99). After your pancakes are a lovely golden colour, lay out your pancakes evenly on a flat surface using the Robert Dyas Bamboo Chopping Board – Large (£6.49). Finally, add in the avocado, dill courgettes and hummus in the middle. Simply fold and roll the pancakes up and enjoy your vegan pancake!